Tax season is here, and it’s time to file your business taxes. We’ll show you what documents you need and how to file your taxes effectively. This tax season, the number of small-business owners submitting self-prepared eFile returns already reflect a 0.9% increase from last year. But even with the benefit of eFiling, taxes are still as complicated as ever. If you don’t file your business taxes, penalties are steep. If the government owes you, you risk losing your tax refund if you don’t file within 3 years of the deadline. And if you owe the government, your small business may be subject to costly penalties and even criminal prosecution. To avoid any problems, make sure you file your taxes by April 15. If you need a little extra motivation, consider that the average refund for tax payers has increased by 1.3% this year. You may be getting some sweet cash back this year. If you don’t know where to start, don’t worry. If that seems like a lot to keep track of, you might try using an accounting software program to stay organized. You don’t want to miss a single one of these bulleted items, and having reliable software to pick up the slack can save you a lot of heartache come tax season. But whether you go that route or not, make sure you know what records to save in either digital or paper formats. If you’ve been in business long enough to have last year’s business tax return, use it. Information you need to file this year’s taxes will already be on your tax return from the previous year. Your taxpayer identification number (TIN) is your unique number that the government uses to identify your business. If you are a sole proprietor, then your tax number will be your social security number. If you are a registered business owner, in either a corporation or a partnership, then your TIN will be your employer identification number (EIN). Accounting records include things like your income statements, small business balance sheet, and your payroll documents. Income statements (also known as a profit and loss, or P&L, statement) show your gross and net income through the entire tax year. This statement will determine your taxable income after you’ve calculated your deductions. The small business balance sheet shows your equity, assets, and liabilities. It will play an important role in filing your business tax return. Your payroll documents provide exact insights into how much your business has paid employees, contractors, and yourself. Every small business owner should have a separate bank account and credit card for their business. At the end of each calendar year, your financial institution will generate a year-end report that shows you exactly what you’ve spent throughout the year. You can use this report to double check your own financial records. If your records don’t match your bank’s year-end report, you’ll need to get to the bottom of things. If your current accounting system isn’t cutting it, consider investing in an accounting software to help you stay organized. Paying taxes is painful, but don’t forget that tax deductions can soften the blow. Tax deductions help determine how much money you owe or how much you get back from the Department of Revenue. The same thing applies to business tax deductions, and the more you have, the less you pay in taxes. But how do you know what’s considered tax deductible for your business? 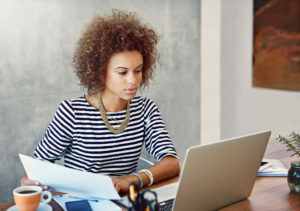 The list of small business deductions is vast, but don’t worry—tax software will ensure you don’t miss out on any possible deductions. What you deduct will depend on the type of business you run. However, there are a few deductions that nearly every business can claim each year. Most business owners use a vehicle for their business. Business owners can deduct expenses related to the cost of owning and operating the vehicle for business purposes. There are two ways to deduct vehicle expenses on your taxes. You can either take the standard mileage rate (54.5 cents per mile) or the actual car expenses you accumulate throughout the year. Don’t forget to limit those deductions to business-related driving. You can choose either option, so take the time to determine which one saves you most on your business taxes. If you aren’t sure how to calculate the difference, use your tax software of choice or consult an accountant. If you rent an office space, then you can deduct your rent payments. Similarly, if you have an in-home office, you can deduct a portion of your mortgage. Keep in mind, the portion of your home you deduct must be used only for business purposes—and to deduct expenses, that home office must be the main location of your business or where you meet with clients. If the room in your home serves any other purpose, you cannot claim it as a tax deduction. So if you’re also using that home office to store your workout equipment or record collection, you can’t count it as a deduction. Any time you take a client out for a meal, you can deduct it. Throughout the year, keep your receipts and make an itemized list of what the meal was for. Do you protect your company with business insurance? Nearly any insurance related to your business can be a tax write-off. In fact, you can deduct 100% of the premiums on your small-business insurance coverage. Deductions are a great way to offset your self-employment taxes, but sometimes they still don’t result in a tax refund. Small-business owners should always prepare to pay taxes at the end of the year. This is especially important if you’ve recently made the jump from working for another company to owning your own business. Unlike typical employees, you’re now responsible for accounting for your tax payments rather than letting your employer withhold taxes from your paycheck each pay period. A good tip for preparing to pay taxes at the end of the year is to set aside 30% of each paycheck. This way, you will have enough saved in case you end up owing the government. Don't sweat tax season Get your maximum refund for your small business with TurboTax. You’re probably well acquainted with Form 1040, the U.S. individual income tax return form. But what tax forms do you use if you’re a small business owner? Well, it depends on what type of business entity you have. Small business owners can register their business as a sole proprietorship, partnership, corporation or S corporation, or a limited liability company. Each entity pays taxes differently and uses different forms to file. Here are the forms you need for each different business entity. A sole proprietor is a business owner who has no legal distinction from their business. That means the owner is liable for any business debts. If you work as a contract worker, such as a freelancer, Uber/Lyft driver, or independent consultant, you could register as a sole proprietor. The company you contract with will send you a Form 1099, which reports how much it paid you that year for your contract work. If you earned more than $400 total in 1099 income, you have to claim this income on your individual tax return (Form 1040). When filing as a sole proprietorship, you must use a Schedule C to file your business tax return. Just attach this form to your individual income tax return (Form 1040), and you’re ready to go. If your business is fairly straightforward (no employees, no inventory, no home deductions, and expenses under $5,000), you can use the less complicated Schedule C-EZ to file your company tax return. A partnership is a business with multiple owners running the company. The partnership itself doesn’t pay income tax—instead, the company profits go to each partner, and each then reports the income on their individual tax return. But a partnership does still file Form 1065 to report all profits and losses related to the business. Partnerships will also need to use a Schedule K-1. This form shows which partners claim specific deductions, credits, income, and more for accurate individual filing. If your partnership employs additional staff, use Form 941 to cover quarterly employment taxes (such as Social Security, Medicare, and income tax withholding) and Form 940 to cover federal unemployment tax (FUTA). Small business owners can also structure their business as a corporation if they want corporate taxation rates. The legal system recognizes corporations as its own legal entity—meaning that, legally speaking, it’s independent from the owner(s). So if the business is sued, the owners’ assets aren’t on the line. Corporations must file a corporate tax return using IRS Form 1120. Take note that S corporations will use Form 1120-S.
Just like partnerships, corporations are also responsible for filing quarterly employment taxes. Use Form 941 to pay the employer portion of your staff’s social security and Medicare taxes, as well as the income tax withholdings from each employee’s paycheck. Form 940 covers the federal unemployment (FUTA) tax. Just like a corporation, an LLC is a separate and distinct legal entity from its owners, even if there is only one owner. Some business owners opt for this set up so that they aren’t personally liable for any business debts if the LLC struggles financially. Depending on how you set up your LLC with the IRS, you might file business taxes as a corporation, a partnership, or a single-member LLC. An LLC taxed as a corporation uses Form 1120 to file taxes. If your LLC has multiple owners, it’s taxed just like a partnership: you file using Form 1065. A single-member LLC pays taxes as if it were a sole proprietorship—meaning you use Schedule C to account for your tax payment and attach it to Form 1040. Questions about what type of business entity you have, or should have if you want to pay the lowest tax rate possible, should be directed toward an accountant. An accountant can estimate what tax amount you would owe depending on what type of business entity you select. No one wants to pay penalties to the IRS for missing deadlines, so it’s important you meet yours. Deadlines vary depending on whether you file taxes quarterly or annually. It doesn’t take long to actually file your taxes, but give yourself a week or two before the following deadlines to make sure you have all your records in order. Some self-employed business owners are expected to pay quarterly estimated taxes if they owe $1,000 or more on annual taxes. But most small business owners will file annual taxes. Here are the important annual tax deadlines small business owners should note. March 15. Partnerships and multi-member LLCs must file Form 1065 with the IRS and distribute Schedule K-1 to their partners. S corporations must file Form 1120-S by this date. April 15. Sole proprietors and single-member LLCs must submit their Schedule C, and corporations (that end their fiscal year on December 31) must submit Form 1120 by this date. For a full list of federal income tax return deadlines, including extension dates, consult the IRS website. To make meeting your deadlines even easier, there are several filing options you can use: filing a paper return, filing electronically yourself, filing through a tax software, or hiring an accountant to file for you. If you’re feeling overwhelmed about filing your small-business taxes, remember that you don’t have to tackle this all by yourself. Tax software programs are built to make sure you don’t forget any deadlines or miss out on deductions. As you get ready to file your taxes this April 15th, look into top-notch tax software programs or consult with an accountant to make sure you’re maximizing your refund. Intuit’s TurboTax has a simple design and flow that makes it stand out from our other listed tax software programs. Although it’s a bit pricier than most, its user-friendly interface provides step-by-step guidance the whole way through. Plus, QuickBooks users can transfer profit and loss data directly to their TurboTax software. As a solid contender in the market for business tax software, H&R Block also offers in-person help when you need it and has several decades of tax experience. Although its software isn’t as flashy as TurboTax, H&R Block offers a variety of packages with modern features and reasonable prices, including a package for small-business owners and a package for freelancers and independent contractors. H&R Block also includes state returns for your business at no extra cost and for an unlimited number of states. Liberty Tax’s Tax Education School is a unique feature that helps tax novices gain tax know-how with online and classroom tax courses. Learn more about our favorite brands.